August 1: Hamilton Loomis Band House Concert, 6:30pm (doors 6:00pm) at The Coda Concert House (2120 E 24th St). A protégé of Bo Diddley, Loomis met the icon backstage at the age of 16 at Houston’s famed venue – Rockefeller’s. Before the night was over, Loomis was onstage playing guitar with the legend. Diddley quickly became friend, mentor, collaborator and supporter, appearing on two of Loomis’ albums and presenting a cherished red guitar that he still plays. With a soulful, r&b take on the blues that is all his own, Loomis has released 6 critically acclaimed albums over the last decade. Described by Blues Blast Magazine as “a non-stop turbo of power, one minute moving from side to side of the stage, and then taking on his horn player in a head-cutting contest on the apron of the stage the next minute.” If you’d like to be a part of this memorable evening, send an email to info@codaconcerthouse.com to make reservations. A confirmation email with the address, directions, parking, etc. will then be sent in return. 100% of all proceeds go directly to the artists performing. July 26–August 5: Stained Glass Theatre Joplin presents “The Count of Monte Cristo”, 7:00pm on Thursdays, Fridays & Saturdays (2:30pm Sundays) at Stained Glass Theater (2101 Annie Baxter Ave). Betrayal, obsession, and redemption provide the backdrop for this compelling adaptation of Alexandre Dumas’ classic novel. While unjustly imprisoned, Edmond Dantes befriends a neighboring inmate who bequeaths him an enormous treasure. Dantes eventually escapes and returns to society disguised as the Count of Monte Cristo with plans to enact his revenge on those who betrayed him. But as Dantes becomes increasingly consumed with his quest for vengeance, he finds himself losing his humanity and any hope of reconciling with the love of his life. Tickets are available at the door, which opens 45 minutes prior to show times. $10 adults; not recommended for children. A handicap ramp is accessible at the rear of the building. For more information, email info@sgtjoplin.com. August 8–12: Joplin Little Theatre presents “Life Could Be A Dream”, 7:00pm (2:30pm Sunday) at Joplin Little Theatre (3008 W 1st St). Life Could Be A Dream is a musical full of 1950’s and 1960’s Doo-Wop Sh-Boom. Take a trip with Denny and the dreamers, a fledging doo-wop singing group preparing to enter the Big Whopper radio Contest to see their dreams of making it big realized! Trouble comes in the form of Lois, who arrives to put some polish on the boys’ hits – Runaround Sue, Earth Angel, Unchained Melody, The Glory of Love – more, more, and more. General Admission: $18; Seniors and Students: $15; Children 12 and Under: $8. For more information or to reserve tickets, call the box office at 417.623.3638 or visit jltplay.org. August 26: Eilen Jewell Band House Concert, 5:30pm (door 5:00pm) at The Coda Concert House (2120 E 24th St). Known for what allmusic.com describes as a “country-flavored and blues-infused version of contemporary folk (which also can include healthy doses of rockabilly and surf),” Jewell’s discography includes several albums of original material and one of Loretta Lynn covers. Jewell has also recorded two albums with her eight-piece gospel-group side project – the Sacred Shakers. But this latest effort, which she and Beek co-produced, with engineering by pianist/banjo player Steve Fulton and Pat Storey, is her first collection of blues (despite the fact that she credits the genre for igniting her musical curiosity in the first place). If you’d like to be a part of this memorable evening, send an email to info@codaconcerthouse.com to make reservations. A confirmation email with the address, directions, parking, etc. will then be sent in return. 100% of all proceeds go directly to the artists performing. August 1: The Nature Discovery Workshop for Teachers, 10:00am–3:00pm at George Washington Carver National Monument (5646 Carver Rd, Diamond, MO). Teachers will investigate the unique habitats and life forms of George Washington Carver’s birthplace and childhood home using the Missouri Department of Conservation Discover Nature Schools curriculum. This educator course will examine how the area is connected through its watershed, landforms, and food-web. Participants will look at the area through today’s lens, as well as through the lens George W. Carver would have witnessed in his childhood. Subjects will include the cultural history of the park, animal and plant adaptations, science note-booking, and habitats. Missouri State Learning Standards and Next Generation Science Standards crosswalks will be available for K-4th grade teachers. All teacher materials for the class will be provided. Field trip opportunities to George Washington Carver National Monument and MO Department of Conservation grants will be covered. Teachers should bring a sack lunch and wear comfortable clothing for an outdoor experience. This event is free and open to the public. For more information or registration, call 417.325.4151. August 2: Homeschool Day – Upcycled Art Workshop, 10:00am at George Washington Carver National Monument (5646 Carver Rd, Diamond, MO). Choose a workshop station and create a masterpiece! Work with artist and teacher Brooks-Elizabeth Billings. Reservations are required for this free workshop. For more information, call 417.325.4151. August 2: First Thursday ArtWalk, 5:30–8:30pm in Downtown Joplin. First Thursday ArtWalk is a sophisticated, yet festive event, for area artists, as well as patrons of the arts…past, present and future! Dozens of artists will be showing or demonstrating their artistic process and all art will be for sale. Participating artists will be located inside various venues along with live acoustic music. Patrons are encouraged to “walk the art” through historic Downtown Joplin. August 2: Spiva Trivia Night (Ages 21+), 6:00–8:00pm at Spiva Center for the Arts (222 W 3rd St). Rounds begin every 30 minutes in Spiva’s Main Gallery. $5 per person each round, and winners take home 75% of the cash. Beer available to participants. This is a 21 and up event. For more information, call 417.623.0183. August 2: Opening Reception: Summer Reading Art Challenge, 6:00pm at Joplin Public Library (1901 E 20th St). Entries from all three categories—adults, teens, and kids—of Post Art Library’s Summer Reading Art Challenge will be on display in the Local History, Genealogy, and Post Reading Room wing inside Joplin Public Library. The purpose of the Summer Reading Art Challenge is to encourage exploration of the visual arts through creating an artwork based on Missouri’s state-wide theme for Summer Reading. Artworks in this year’s exhibit are inspired by music, the Summer Reading theme for 2018. For more information, including how you can participate, contact Post Art Library Director, Jill Sullivan, at 417-623-7953 x1041. August 3–5: Joplin Emancipation “Park Days” Celebration 2018, 9:00am at Ewert Park (SE Murphy Blvd). The Emancipation Celebration Committee will be presenting its 2018 Annual Emancipation “Park Days” Celebration. Emancipation “Park Days” is a Joplin tradition, having been celebrated annually since at least 1914. This cultural event aims to educate on African American freedom and achievement, while promoting cultural diversity and respect for all cultures. “Park Days” also supports other Committee objectives of serving, educating, and advocating in the community. Three full days of community activities are planned, including: live entertainment, 11th annual car show, kids fun run, resource booths, Kids Fest, Movie in the Park, free swim, kids picnic, historical re-enactments, kids crafts, and much more. All activities are free and open to the public. Historically, Emancipation Celebration has been a time of family reunion for local African American families. However, with Joplin, MO having an African American population of 7%, families have bi-racial children, mixed-race marriages, and adopted children from various ethnic backgrounds. The celebration aims to teach African American history and culture while uniting all races in the community. For more information, call 417.438.4980. August 3: Lunch and Learn: Art and Nature with Shaun Conroy, 11:00am–Noon at Spiva Center for the Arts (222 W 3rd St). Join Exhibits Director Shaun Conroy shares the story of how the genre of Wildlife Art evolved over four centuries of cultural events, aesthetic and ideological trends, from it beginning in colonial times to the epic work of the present day. For more information, call 417.623.0183 or visit spivaarts.org. August 3: First Friday WineShare, 6:00–8:00pm at TBA. WineShare is a national event that takes place on the First Friday of each month. It’s a great opportunity to meet new friends or catch up with old ones. It’s also a fantastic way to kick off date night! Feel free to bring friends or colleagues, as well. Bring a bottle of wine or a craft beer and The Downtown Joplin Alliance will take care of the rest. As always, there is no charge to attend WineShare and everyone 21 years of age and older is welcome. This event is free and open to the public. For more information, email info@downtownjoplin.com. August 4: Summer Junior Rangers (Ages 8–12), 10:00am at George Washington Carver National Monument (5646 Carver Rd, Diamond, MO). This annual event series gives children a “behind the scenes” look at what it’s like being a park ranger and a unique opportunity to learn more about George Washington Carver and the NPS through a variety of hands-on and small group activities. This event is free and open to the public. For more information, call 417.325.4151. August 5: Carver Laboratory Demonstrations, 11:00am at George Washington Carver National Monument (5646 Carver Rd, Diamond MO). Want to learn about some of the products George Washington Carver developed in his laboratory? Discover how Carver used some often-overlooked plants to change the way you think about agriculture. This event is free and open to the public. For more information, call 417.325.4151. August 7: Chat N Craft (Adults), 5:30–8:00pm at Joplin Public Library (1901 E 20th St). An adult crafting group that meets on the first Tuesday of the month. All types of hand work welcome. Share ideas, tips and tricks with other crafters. Bring your current craft project and join for laughter, friendship and fun! For more information, visit chatncraft.wordpress.com. August 7: 2018 Movie in the Park presents Justice League, 8:30pm at Schifferdecker Park (W 4th St). Bring your family, a date, a group of friends, or even fly solo as you enjoy a movie under the stars. Blankets and lawn chairs are encouraged. Concessions will be available for purchase on-site. All movies start at dusk, unless otherwise noted. This event is free and open to the public. For more information, call 417.625.4750. August 7: Wizard Rock Concert: Tonks & the Aurors with Lauren Fairweather, 7:30pm at Joplin Public Library (1901 E 20th St). Finish up summer with a free, wizard rock concert by Tonks & the Aurors with Lauren Fairweather (founder of The Moaning Myrtles). Enjoy original rock music about the Harry Potter universe from the band’s newly released album, “HUFFLERIOT!” This event is free and open to the public. For more information, call 417.623.7953. August 9: Joplin Writers’ Guild, 6:00pm at Joplin Public Library (1901 E 20th St). The Joplin Writers’ Guild, a chapter of the Missouri Writers’ Guild, includes a wide variety of writers – from hobbyists to professional, published writers. Members have published novels (romance, mystery, historical, middle grade, YA, etc. ), nonfiction books (regional history and the Arcadia Images of America series), and articles (travel, education, law topics, etc.). The group focuses on supporting each other and sharing information about the publishing and writing industries. This group is open to the public. Dues are $7.50 for the year, but anyone interested can attend their first meeting free. For more information, search “Joplin Writers’ Guild” on Facebook. August 11: Coloring Book Club, 10:30am at Spiva Center for the Arts (222 W 3rd St). Every second Saturday, bring your coloring book or sketchbook and get creative. Relax, chat, and color. Spiva provides some coloring pages and markers, but it’s best to bring what you prefer or purchase items in the Gift Shop! Admission is free and open to the public. For more information, call 417.623.0183 or visit spivaarts.org. August 11 & 12: Expressions of the Soul, 1:00pm at George Washington Carver National Monument (5646 Carver Rd, Diamond MO). Carver had a passion for art and believed that his creations were expressions of his soul. See images of Carver’s artwork that he used to convey the sense of serenity and personal rejuvenation. This event is free and open to the public. For more information, call 417.325.4151. August 11: Midwest Regional Ballet Company & School presents Contemporary/ Hip-Hop Workshop, Session #1: 11:00am–12:30pm & Session #2: 1:30pm–3:00pm at Midwest Regional Ballet Company & School (2101 Stephens Blvd). This workshop will feature Adam and Shayna Acosta, renowned choreographers and founders of The Legacy Project in Tulsa, OK. The duo most recently joined Oral Roberts University teaching Hip-Hop, Contemporary, and Jazz Funk. Adam and Shayna have performed and choreographed in MTV music videos, choreographed national commercials, taught dance at Tulsa University, and have shared the stage with four-time Grammy Winner Israel Houghton. They have directed and choreographed four original full stage productions and their choreography has won national awards and can be seen all over the country. Session #1 will include advanced contemporary in Studio C and intermediate Hip-Hop in Studio B. Session #2 will consist of advanced Hip-Hop in Studio C and intermediate contemporary in Studio B. Cost: $55 per dancer. For more information, call 417.439.9549 or email kayelewis_mrb@hotmail.com. August 11: Shoal Creek Water Festival, 9:00am at Wildcat Glades Conservation Center (201 Riviera Dr). Shoal Creek Water Festival 2018 will feature a ton of fun activities for the entire family. The day will begin with a fishing derby for kids at Walter Woods Conservation Area (contact the Missouri Department of Conservation to register 417.629.3423). Beginning at 9:00am, borrow one of Wildcats inner tubes to float, splash, and swim in Shoal Creek. The Wildcat Friends Group will host a wild and wonderful water balloon volleyball tournament (with biodegradable balloons, of course) – register your team today! The Kid’s Shoe Box Boat Race is a staple at this event. Kids create a boat from a shoe box and race them in the Wildcat Spring. Registration must be made before August 8th (scholarships are available). The inner tube race is back this year! Decorate your own inner tube and register before or on the day of the event. Registration is $5 and includes a ton of laughs. Inner tubes must only be self-propelled (paddles are allowed). This year will feature the Stone Lion Puppet Show. This international act will be held inside the entertainment tent. Ducks are also racing again this year. Purchase a duck for $5 or three for $10 and decorate it with paint or markers. Bring him/her back to the Festival and get him in the water. Some of your favorite food trucks will be on site along with Tropical Smoothie. Peruse the twenty plus booths, including kids activities, at any time of the day. Get your crew ready now to create a winning cardboard boat. Get wild and challenge your family members, another department at work, a rival team, or another school group. Registration is $25 and the proceeds help fund future Water Festivals. All awards will be presented in the entertainment tent. Shuttle parking will be available. Remember to bring a towel or wear appropriate bathing attire. For more information, call 417.708.7713 or email chris@wildcatglades.org or robin@wildcatglades.org. August 16: Third Thursday, 5:30–8:30pm on Main Street in Downtown Joplin. Third Thursday is Joplin’s trademark cultural event. Come with your friends and family to stroll through Downtown, eat great food, listen to music, peruse local art and shop! August 17: Opening Reception, 5:30–7:30pm at Spiva Center for the Arts (222 W 3rd St). New exhibits are opening at Spiva Center for the Arts! Come see At Ease: Veteran Contemporary in the Main Gallery and Angel Brame: One Per Day, A Year of Small Decisions in the Regional Gallery. Preview the exhibits a day early, mingle with friends, and enjoy refreshments. $5 suggested contribution; members free. For more information, call 417.623.0183 or visit spivaarts.org. August 18: Art and the Military Panel Discussion, 11:00am at Spiva Center for the Arts (222 W 3rd St). Featuring Dr. Tara Tappert of The Arts and the Military, Geraldine Craig, Professor of Art at K-State and creator of the Earl Project, Ted and Amy Donaldson of Joplin’s Compass Quest, and David Ross, veteran and Vet Art participant. Mediated by Josie Mai. Donations are encouraged. For more information, call 417.623.0183 or visit spivaarts.org. August 18 & 19: Agricultural School on Wheels, 1:00pm at George Washington Carver National Monument (5646 Carver Rd, Diamond MO). The Jesup Wagon, also known as the Agricultural School on Wheels, carried George Washington Carver’s bulletins in addition to many other useful supplies to southern farmers. A park ranger will share the story of this fascinating teaching tool. This event is free and open to the public. For more information, call 417.325.4151. August 20: MSSU Spiva Gallery Look to Norway Reception, 4:00pm at MSSU Spiva Art Gallery (3590 Newman Rd). A group exhibition featuring artwork created by MSSU art and design students enrolled in the Spring 2018 International Art Seminar. This course culminated in a trip over spring break to study the art, culture, and landscape of Norway. The students traveled to Oslo, Flam, and Bergen, visiting art and cultural museums, national treasures, and historic sites. Students also participated in numerous cultural dinners and both coastal and inland fjord tours. The works of art created for this show were inspired by each student’s experiences throughout the trip. The students aim to express the history, landscape, and aesthetic of Norway within their art. They want the show to represent the beauty and culture of Norway in every aspect of their pieces. The exhibition includes works of art by MSSU art and design majors Brett Dorrance, Jenson Maydew, Hunter Mills, Amber Wagner, Cicily Atkinson, and Susan Griffith. The trip was led by Dr. Christine Bentley, associate professor of art and design. August 20: Downtown Poetry Reading and Open Mic, 6:00–8:00pm at Joplin Avenue Coffee Company (506 S Joplin Ave). The featured poet for August is Karen Craigo. Craigo is the author of three poetry collections — Passing Through Humansville (Sundress, 2018), No More Milk (Sundress, 2016), and Escaped Housewife Tries Hard to Blend In (forthcoming from Tolsun Books) — and three chapbooks. She is the editor of a weekly newspaper in Marshfield, MO. Open Mic sign-ups begins at 6:00pm. Featured poet will begin reading at 6:15pm. Open mic starts at 7:00pm. This event occurs on the third Monday of each month – same place, same time. For more information, email DowntownPoetry@gmail.com or send them a message through Facebbok. August 24: Storytelling Days, 6:00pm at George Washington Carver National Monument (5646 Carver Rd, Diamond, MO). To celebrate the National Park Service’s birthday all weekend long, visitors are invited to come hear the stories these special places and spaces hold with various storytellers. The units protect not only scenic beauty in places like the Grand Canyon and Yosemite, but powerful stories, too – like George Washington Carver’s and more. This event is free and open to the public. For more information, call 417.325.4151. August 25: JRAC Coffee Hour, 10:00am at Beckett’s Cafe (705 Illinois Ave). Joplin Regional Artists Coalition (JRAC) Coffee Hours offer JRAC members the opportunity to network, socialize, announce personal art-related news, discuss a pre-determined general art topic, or participate in a professional development workshop. JRAC Coffee Hours are held on the fourth Saturday of each month and you must be a JRAC Member to attend. Membership dues for JRAC are $35 annually. JRAC is a not-for-profit established to empower visual artists in the area by helping them network with other artists and the community-at-large. For more information, contact joplinrac@gmail.com. August 25: Storytelling Days, 11:00am at George Washington Carver National Monument (5646 Carver Rd, Diamond, MO). To celebrate the National Park Service’s birthday all weekend long, visitors are invited to come hear the stories these special places and spaces hold with various storytellers. The units protect not only scenic beauty in places like the Grand Canyon and Yosemite, but powerful stories, too – like George Washington Carver’s and more. This event is free and open to the public. For more information, call 417.325.4151. August 26: Founders Day, 1:00pm at George Washington Carver National Monument (5646 Carver Rd, Diamond MO). The National Park Services was established by the Organic Act of 1916. Park staff invites visitors to attend a special ranger-led program, join in on activities, and share their favorite National Park Service memory. This event is free and open to the public. For more information, call 417.325.4151. August 28: MSSU Nordic Film Festival: The Shadow of the Raven, 7:00pm at Missouri Southern State University, Cornell Auditorium (3950 Newman Rd). MSSU opens the Nordic Semester with what some have called the best Viking film ever made, a family saga of love and revenge. Bring your helmets, beards and braids! Free and open to the public. The Missouri Southern Institute of International Studies and the Harrison and June Kash International Film Society present the following distinguished repertoire of Nordic films. The MSSU Nordic Film Festival provides a rare opportunity to enjoy the best works of creative directors and performers from Sweden, Norway, Denmark, Finland, and Iceland. Most of the films are being shown at MSSU for the first time and have received great critical recognition and superb reaction from contemporary audiences. All films will have English subtitles and all are free and open to the public. Please note that some of the films are intended for mature audiences only. For more information, call 417.625.9736. Saturday: Joplin Empire Market, 10:00am–3:00pm at Joplin Empire Market (931 E 4th St). The Joplin Empire Market is the place to find the best in locally grown produce, gourmet foodstuffs, and handmade artisan goods. Housed in a historic brick building adjacent to downtown, this indoor/outdoor public market is Joplin’s newest gathering spot. For information on being a vendor, check out joplinempiremarket.com. Wednesday–Sunday: Bookhouse Cinema (715 E Broadway). Bookhouse Cinema is and independent micro theater and pub in the East Town neighborhood. They show a variety of independent, classic, and foreign films while offering a great pub environment. Click here for showings and times. For more information, call 417.825.5161. August 1 – 31: Nature’s Wild Thing: I Think I Love You by David Parks, Spiva Center for the Arts, Upstairs Gallery (222 W 3rd St). Self-taught local photographer David Parks will exhibit his collection of work from over 40 years of picture taking. August 1 – 31: Paintings from Inspiring Places by J. Todd Williams, Urban Art Gallery (511 S Main St). Williams’ show will consist of oil paintings and mixed media pieces detailing places he’s traveled that have caught his eye along the way. J. Todd Williams was born and raised in Carthage, Missouri – a small community filled with history and fine artists. His artistic talent became evident at an early age when he was in elementary school, a watercolor he created of the Missouri State Capitol was chosen to be shown on a national television show called, Stand Up and Cheer. Encouraged throughout his school years by instructors, family and friends to continue exploring and developing his natural abilities, Williams earned his Bachelor of Arts Degree in Fine Art from Missouri Southern State University. Upon graduation, he began a career in the field of graphic art. He has worked as an art director, graphic designer and photographer for several large product manufacturing companies. Though spending many years building his career in graphics, he has never lost sight of his true passion – creating fine art. He always finds time to paint, sketch, or photograph the world around him. Williams enjoys creating art in the mediums of oil, pastel, acrylic and watercolor. He uses rich, vibrant color to bring life and inspiration to his art and design pieces. “If I can capture through my artwork a mood, a feeling that compels the viewer to reminisce about a place they’ve been, or just reaches out to them, to me, that’s a success. That’s what I want to achieve.” In 2006, Todd began licensing his artwork on gift and home décor products. In 2008, he signed on with a publisher to reproduce his pieces as wall art. His work quickly caught on in the art world and is currently being produced on many products in the home décor industry. These products include: specialty wall pieces, tabletop items, floor coverings, textiles, puzzles, party ware, garden flags, greeting cards, journals, fashion items and other gift and home décor. Todd currently resides in Neosho, Missouri with his wife, Tamie; son, Alex and daughter, Kaitlyn. August 2 – September 28: Summer Reading Art Challenge Exhibition, Joplin Public Library (1901 E 20th St). Entries from all three categories—adults, teens, and kids—of Post Art Library’s Summer Reading Art Challenge will be on display in the Local History, Genealogy, and Post Reading Room wing inside Joplin Public Library. An opening reception will be held on Thursday, August 2 from 6:00–7:30pm to honor all participants. The purpose of the Summer Reading Art Challenge is to encourage exploration of the visual arts through creating an artwork based on Missouri’s state-wide theme for Summer Reading. Artworks in this year’s exhibit are inspired by music, the Summer Reading theme for 2018. For more information, including how you can participate, contact Post Art Library Director, Jill Sullivan, at 417-623-7953 x1041. August 13 – August 31: Look to Norway, MSSU Spiva Art Gallery (3590 Newman Rd). A group exhibition featuring artwork created by MSSU art and design students enrolled in the Spring 2018 International Art Seminar. This course culminated in a trip over spring break to study the art, culture, and landscape of Norway. The students traveled to Oslo, Flam, and Bergen, visiting art and cultural museums, national treasures, and historic sites. Students also participated in numerous cultural dinners and both coastal and inland fjord tours. The works of art created for this show were inspired by each student’s experiences throughout the trip. The students aim to express the history, landscape, and aesthetic of Norway within their art. They want the show to represent the beauty and culture of Norway in every aspect of their pieces. The exhibition includes works of art by MSSU art and design majors Brett Dorrance, Jenson Maydew, Hunter Mills, Amber Wagner, Cicily Atkinson, and Susan Griffith. The trip was led by Dr. Christine Bentley, associate professor of art and design. August 18 – October 6: At Ease: Veteran Contemporary, Spiva Center for the Arts, Main Gallery (222 W 3rd St). The exhibit will feature approximately 60 pieces of work from artists involved in the current veteran art movement. Art will be obtained from the National Veterans Art Museum, ART-ifact, and Kansas City-based veteran artists. The objective is to showcase works made by veteran artists, present the arts as a viable career path for veterans, and to highlight the arts as a therapeutic and alternative treatment option for mental health challenges. The purpose of the contemporary veteran art exhibition is to establish a conversation in the community, highlighting issues of concern to veterans and their families. Issues common among veterans include the transition from military to civilian life, education, employment, poor healthcare, and the effects of combat and military service injuries such as PTSD, TBI, Military Sexual Trauma (MST) and homelessness. Nationally, there are 500,000 veterans living with TBI or PTSD. There are 20 suicides per day. According to the Missouri Veterans Commission, in 2016 there were 9,685 veterans in Jasper County in 2016 and 5,090 veterans in Newton County in 2016. August 18 – October 13: Angel Brame: One Per Day, A Year of Small Decisions, Spiva Center for the Arts, Regional Gallery (222 W 3rd St). In an effort to assign herself a task that would push her creativity and encourage growth, local artist Angel Brame chose to make one small pottery piece per day for an entire year with a few stipulations: each piece must be a pouring vessel and must be small. Join in as Angel shows a year’s worth of extraordinary work. July 10 – September 30: Woodturners of Southwest Missouri, Joplin Public Library (1901 E 20th St). The Woodturners of Southwest Missouri, a not-for-profit 501c3, are a group of individuals that make up a local chapter of the American Association of Woodturners. The Purpose of the Club is “To publicly promote woodturning, to strengthen the woodturning community, and to assist and encourage individuals to a higher standard of excellence in woodturning.” Seventy-five pieces created by members of the group are on display inside Joplin Public Library from Tuesday, July 10, 2018 through Sunday, September 30, 2018. Individuals interested in learning more about the Woodturners of Southwest Missouri may visit www.woodturnersofswmo.org. For more information about the display, contact Post Art Library Director, Jill Sullivan, at 417-623-7953 x1041. 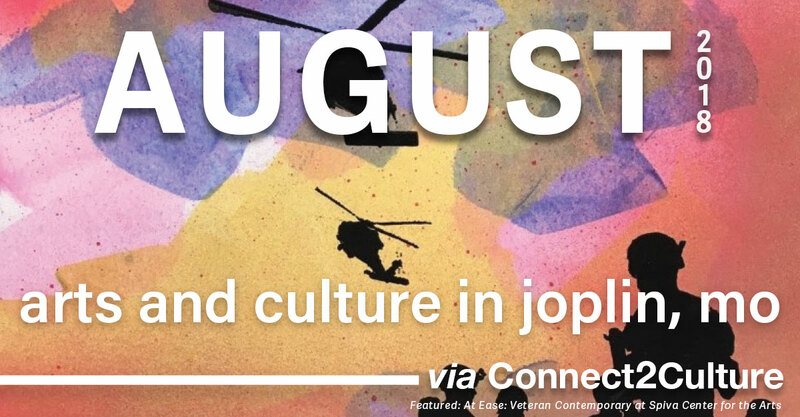 July 10 – September 30: Exploration by Jodie Sutton, Joplin Public Library (1901 E 20th St). Exploration is comprised of pieces that reflect the various stages of Jodie Sutton’s four-year journey in encaustic painting. After a long break from the fine arts, she found herself with a desire to disconnect from the daily barrage of technology and taught herself the basics of encaustics. She soon transitioned from experimenting in photo encaustics to creating abstract landscapes and nonrepresentational pieces. Sutton enjoys exploring the texture, translucent quality, and fluidity that can be achieved through the medium. Encaustic is a wax-based paint made of beeswax, resin, and pigment. The mixture is heated to about 170 degrees Fahrenheit and kept at a molten state for painting. The encaustic paint is applied to a rigid surface. After each layer is applied, the piece is fused by blowtorch or heat gun. This technique creates a unique texture and vibrancy that’s difficult to reproduce in other mediums. Exploration is on exhibit in The Bramlage and Willcoxon Foundation Gallery inside Joplin Public Library from Tuesday, July 10, 2018 through Sunday, September 30, 2018. For more information, contact Post Art Library Director, Jill Sullivan, at 417-623-79853 x1041. June 30 – August 4: Art and the Animal, Spiva Center for the Arts, Main Gallery (222 W 3rd St).“The Society of Animal Artists” is an organization of artists from Africa, Asia, Australia, Europe, North America, and South America who produce the best animal art in the world. Spiva will exhibit a selection of works from the society’s Annual Exhibition that premiered at Hiram Blauvelt Art Museum, New York City, as part of the society’s 57th anniversary. Following the premiere of the Annual Exhibition in New York, a selection of 45 flatworks and 15 sculptures from the exhibit is traveling to prestigious venues that include National Mississippi River Museum and Aquarium, Dubuque, Iowa; the Brookgreen Gardens Murrells Inlet, Myrtle Beach, S.C.; the Arizona-Sonora Desert Museum, Tucson, Ariz.; and Spiva. “Art and the Animal” refers to both the SAA Annual Exhibition and the Traveling Exhibition and Tour that was generated from it. It is a juried competition open only to members of SAA. Founded in 1960, the mission of the society is to promote excellence in the portrayal of animals, domestic and/or wild, in art. June 30 – August 4: Charlotte Street Foundation, Spiva Center for the Arts, Regional Gallery (222 W 3rd St). Charlotte Street’s Curatorial Residency Program launched in 2012 with the mission to engage outstanding, emerging curators from around the country with the Kansas City region and its artists. This exhibit pushes Spiva’s traditional regional boundary and features three current resident artists of CSF: Ruben Castillo, Glyneisha Johnson, and Rebekah Pech Moguel. Spiva hopes our own local artists will learn about and be inspired by the possibilities of an artist residency, with Charlotte Street Foundation or elsewhere. Glyneisha Johnson is a recent graduate of the Kansas City Art Institute’s Painting Department. She has exhibited in various solo and group exhibitions in Kansas City, including Undergrads Underground at Leedy-Voulkos Art Center. Through collage, painting, and drawing, Glyneisha Johnson’s work echoes nodes of black culture and her experience of being raised in the South. The work also acknowledges the importance of Black domestic spaces within a society that often overlooks these spaces and the people who inhabit them. She uses the language of collage as a metaphor to describe the dislocated, collaged nature of Black history due to colonialism. Ruben Bryan Castillo is a visual artist born in Dallas, TX and currently lives and works in Kansas City, MO. He received his B.F.A. in Printmaking at the Kansas City Art Institute in 2012 and his M.F.A. in Visual Art from the University of Kansas in 2017. His work addresses themes of intimacy, queerness, place, and the body through autobiographical narratives using drawing, printmaking, sculpture, installation, and video. Rebeka Peck Moguel is a Kansas City based visual artist. She graduated from the Kansas City Art Institute with a B.F.A. in Photography and Art History in 2017. Her work bases itself on a photographic practice but uses different mediums to create a multi-dimensional experience. Her work deals with culture identity and is specific to her experience growing up in a Mexican household in Midwest America. Through her work, she invokes the spaces of culture that we all have a close familiarity to. August 1, 8, 15: Uke Can Play!, 6:00pm at Joplin Public Library (1901 E 20th St). Post Art Library Director, Jill Sullivan, will lead a series of ukulele workshops at Joplin Public Library. Currently, the August session is FULL. Attendees will learn ukulele basics, such as the types of ukuleles, the parts of the instrument, how to tune a ukulele, basic chords and strumming patterns, and a few songs. Ukuleles are provided for the duration of the 3-week class. Registration is necessary–space is limited. Call 417.623.7953 x1023 to register. Participants are encouraged to attend all three workshops in this session for a chance to win a ukulele. Library card not needed. August 2: Vet Art Classes – Abstract Painting, 6:00pm at Spiva Center for the Arts (222 W 3rd St). Learn to “let go” by painting without the pressure of the visual representation of objects. Use shape, color, and gestural marks to paint freely and expressively. Attendees will take home at least one painting. Taught by Sandra Conrad, local teaching artist. Free to all veterans. Veterans only. Limit 15. For more information, call 417.623.0183 or visit spivaarts.org. August 7: Writing Workshop, 6:30pm at Joplin Public Library (1901 E 20th St). Refine your fiction – fan or formal – with writing tips from the editors of Wizards in Space literary magazine. This workshop is for teens and adults; no registration needed. For more information, call 417.623.7953. August 14 & 28: Local Color Wind Chime Workshop, 6:00pm at Local Color Art Gallery & Studio (1027 S Main St). Don’t miss this exciting opportunity to create your own wind chime with this two-part workshop. In session one, students will create the pieces that will make up the wind chime. In session two, students will assemble the wind chime they have created. This class is limited to 12 people. For more information, or to reserve your spot, call 417.553.0835. Cost: $45 per person. August 15: Preschool Nature Connections: Leaping Lizards (Ages 3-6), 1:00pm at Wildcat Glades (201 Riviera Dr). What’s it like to be a lizard, and can they really leap? Join Wildcat Friends Group and find out about lizard sunbathing, scales, and tails. Read a story, make a craft, and go on a lizard “hunt’ in the park and see if you can find them! All programs will be held at the Creek Pavilion along Shoal Creek in Wildcat Park – not at the Center. All programs are free of charge, but registration is requested. To register, please email wildcatgladesfg@gmail.com. August 18: Yoga in Nature for Kids! (Ages 2+), 9:30am at Wildcat Glades (201 Riviera Dr). Led by a Registered Yoga Teacher from 4-States Yoga studio, this class is designed to incorporate elements of fun, breathing and yoga poses. Bring your yoga mat or a towel, and a reusable water bottle. All programs will be held at the Creek Pavilion along Shoal Creek in Wildcat Park, not at the Center. All programs are free of charge, but registration is requested. To register, please email wildcatgladesfg@gmail.com. Classes are limited to the first 15 students. August 18: Preschool Nature Connections: Leaping Lizards (Ages 3-6), 10:00pm at Wildcat Glades (201 Riviera Dr). What’s it like to be a lizard, and can they really leap? Join Wildcat Friends Group and find out about lizard sunbathing, scales, and tails. Read a story, make a craft, and go on a lizard “hunt’ in the park and see if you can find them! All programs will be held at the Creek Pavilion along Shoal Creek in Wildcat Park – not at the Center. All programs are free of charge, but registration is requested. To register, please email wildcatgladesfg@gmail.com. Tuesday from 9:00am–Noon & Wednesday from 4:30pm–7:30pm: Painting with Pam Leisenring at Hobby Lobby (1315 S Rangeline Rd). Pam has been teaching fine art classes privately for 32 years and continues to bring individualized instruction to expand the artistic experience of beginners and established artists alike. Each student chooses a preferred medium (Acrylic, Pastel, Watercolors, etc.) and subject matter These are ongoing classes and students may join at any time. New members alway welcome. For more information, call 417.781.3839. $20 per class, all materials provided for first class. Tuesday: Creation Station (Ages 6-11), 3:45–5:00pm at Spiva Center for the Arts (222 W 3rd St). Drop in Tuesday afternoons and experiment with a variety of media: painting, drawing, clay, collage, sculpture, and printmaking. Explore the galleries with scavenger hunts and other activities. Pre-registration is recommended. Space is limited in this popular class. Sponsored by Dr. John and Joy Cragin. Cost: $6 pre-registration ($8 at the door). Thursday: Memories in the Making®, 10:00am–Noon at Spiva Center for the Arts (222 W 3rd St). This art experience is centered on the expression of creativity through painting for those dealing with memory loss. There is no charge for the class and no prior art experience is necessary. Memories in the Making® is hosted by the Alzheimer’s Association, Greater Missouri, in conjunction with George A. Spiva Center for the Arts. Sponsored by St. Avips. The class is held weekly from March 1–November 16. For more information, call 417.623.0183 or visit spivaarts.org. Friday: Date Night, until 8:00pm at Firehouse Pottery-Joplin (112 S Main St). Looking for something different to do on a Friday night? Firehouse Pottery-Joplin has something just for you. Friday nights are date night 2-for-1 studio fees until 8:00pm for all couples. For more information, call 417.553.0671. Tuesday: Ladies’ Night Out (Ages 18+), until 8:00pm at Firehouse Pottery-Joplin (112 S Main St). Ladies! Gather your girls and enjoy a creative evening with Firehouse Pottery-Joplin and free studio fees as well. For more information, call 417.553.0671. Tuesday & Saturday: Makerspace Open Studio, 4:00pm–7:30pm on Tuesday and 9:30am–2:30pm on Saturday at the Joplin Public Library Makerspace (1901 E 20th St). Post Art Library, Joplin Public Library, and Joplin Makers have partnered for Second Saturday Makerspace Open Studio events. On the second Saturday of each month, the Joplin Public Library Makerspace will be open on a walk-in, first come, first serve, basis. You do not need a library card to use the maker space. Use of all makerspace equipment is free (though a small fee applies to 3D prints) and open to the public. Patrons under the age of 18 must be accompanied by parents or legal guardian to use the maker space during this event. Makerspace equipment is in-house use only. For information, call 417,623.7952, ext. 1041. View our list of summer arts camps and classes here: http://connect2culture.org/summer-art-camps-and-classes-2018/.